We have now been away one week. We got up early. Mike and Mary came over for breakfast. All four of us went to Fiesole and caught the bus for Florence. 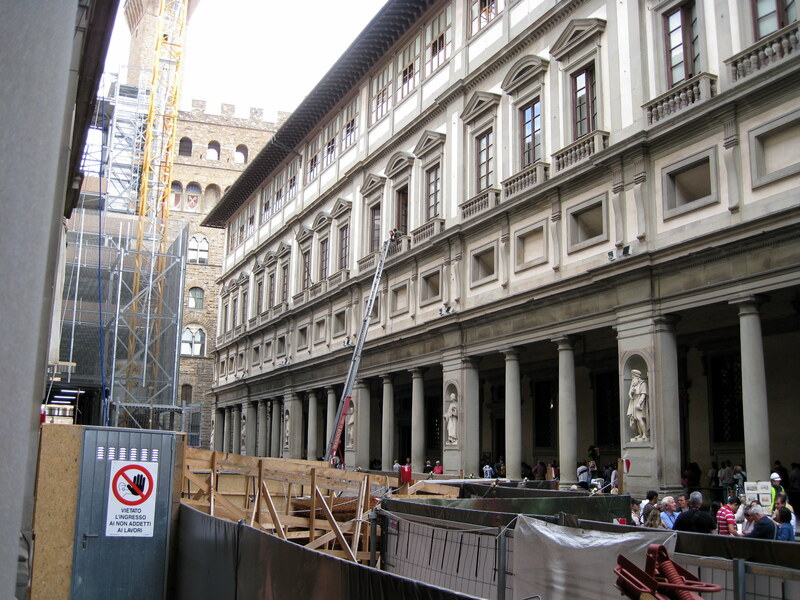 We had decided to put off the dentist for my wife until the next day as we had a 10:45 reservation for the Uffizi. Again I want to emphasize how important it is to plan well in advance the day and time you want to visit very popular sites such as museums. Months before this trip, we already had reserved tickets, to Arena Chapel in Padua, to the Uffizi and the Academia in Florence, a concert and the Doge Palace in Venice plus dinner reservations for several restauran ts in Venice. Without advanced tickets there are very, very long waiting lines often resulting in still not being able to go in. The waiting line at the Uffizi Museum was extremely long. We got in the advance ticket line which only took at few minutes and got our tickets, but had to go through a lot of security. 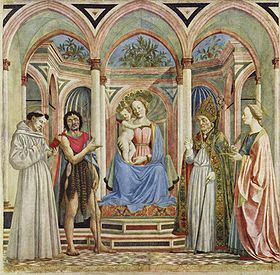 Pollaiunolo’s Hercules and the Hydra (gallery 13), many great works by Botticelli including The Discovery of Holofernes, The Adoration of the Magi, Primavera and The Birth of Venus (left below) (galleries 15 and 16), Filippa Lippi’s Adoration of the Child and the Adoration of the Magi (gallery 17) , Landscape and the Adoration of the Magi by da Vinci (gallery 18), Michelangelo’s Holy Family (gallery 20) Raphael’s Madonna of the Goldfinch and Self Portrait (galleries 23 & 25), and Madonna of the Long Neck by Parmigianino (gallery 36). It was wonderful to take our time and spend as long as we wanted with each painting. That is not possible as a tour. We had coffee in the Uffizi’s café which was on the roof. I got some great pictures of the dome of the Duomo. From there we could also see the cathedral bell tower at the bus stop in Fiesole. We came across a great café for lunch. I had a chicken and mushroom in sauce and my wife had gnocchi. Mike and Mary went to find an internet café. We walked across the Ponte Vecchio Bridge on our way to Santa Marie del Carmine where the Branca cci Chapel is located. It was a long walk, but it was a nice day so we enjoyed it. 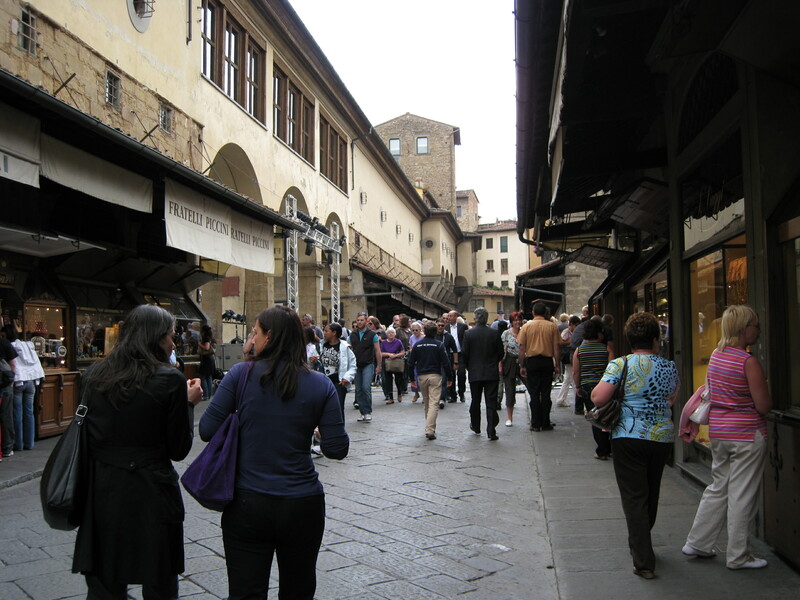 Crossing the Ponte Vecchio Bridge was an interesting experience with all of the little shops selling gold jewelry. 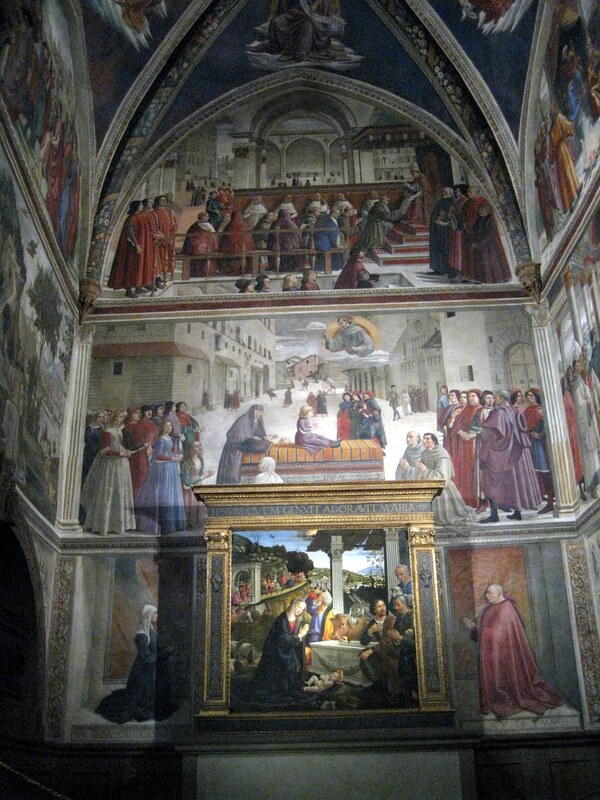 We very much wanted to see the Brancacci Chapel We had studied the great frescos by Panicale and Masaccioe and finished by Filippino Lippi which depicted incidents in the life of the apostle Peter. 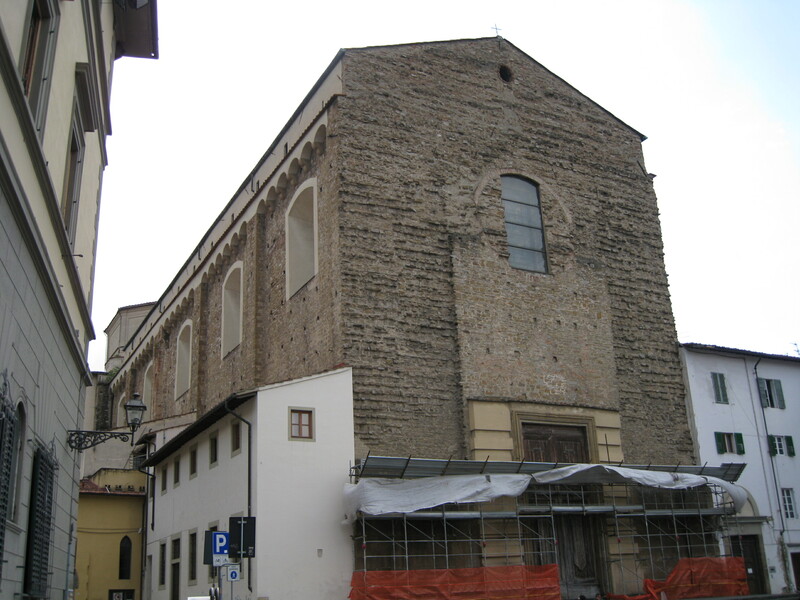 The exterior of the church was very plain with only the fire brick for a the façade. Much to our great disappointment, the church was closed on Tuesdays. Several blocks away we found another church…St. Federia but it was also closed because of a funeral. 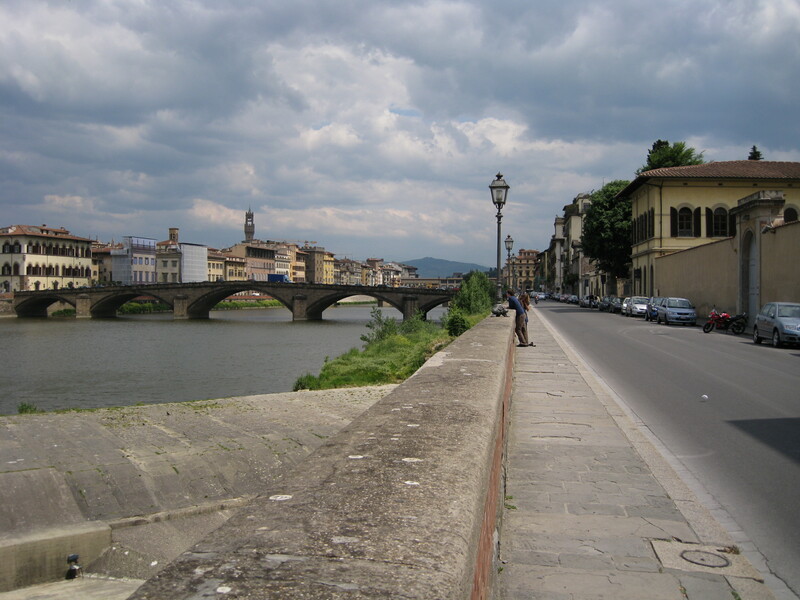 We walked back along the Arno River which provided a beautiful panoramic view of Florence across the river. 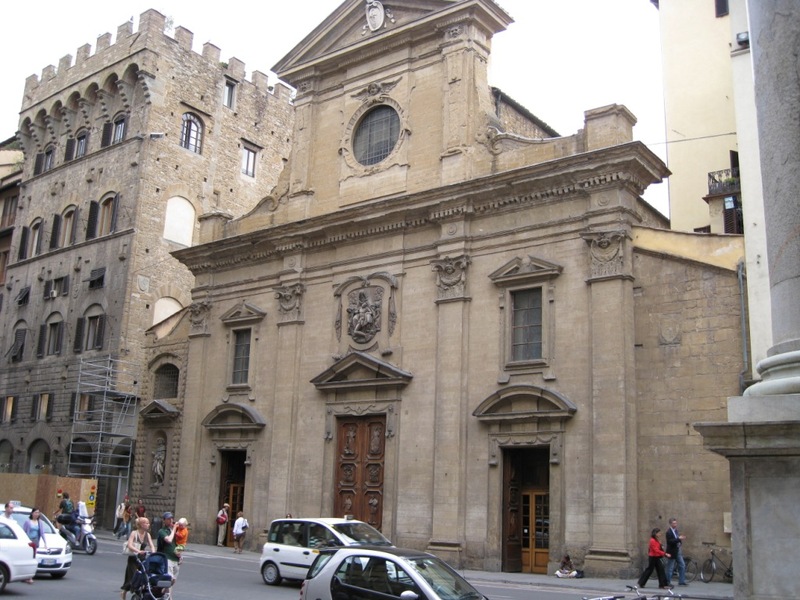 We found St. Spirito Church which was on our list to visit, but it was closed until 4:00…it was then 3:00. We were getting a little discouraged, so we got a gelato and walked across a nearby bridge. This bridge was parallel to the Ponte Vecchio Bridge. We found a silver store and bought a wine coaster and two silver picture frames. 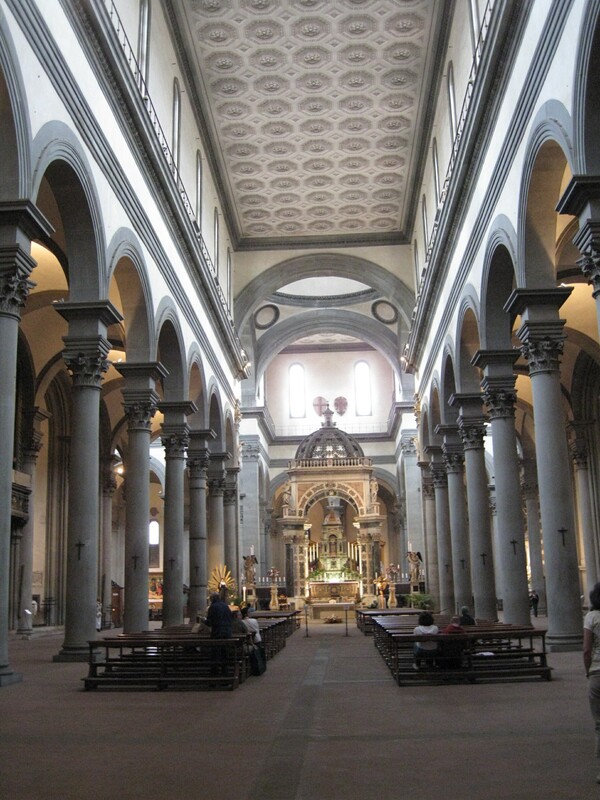 We went back to St. Spirito which was designed by Brunelleschi in 1435. 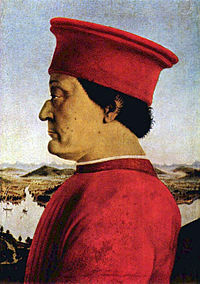 It was finished after his death in the late 15th century. The church was now open. It was very beautiful. 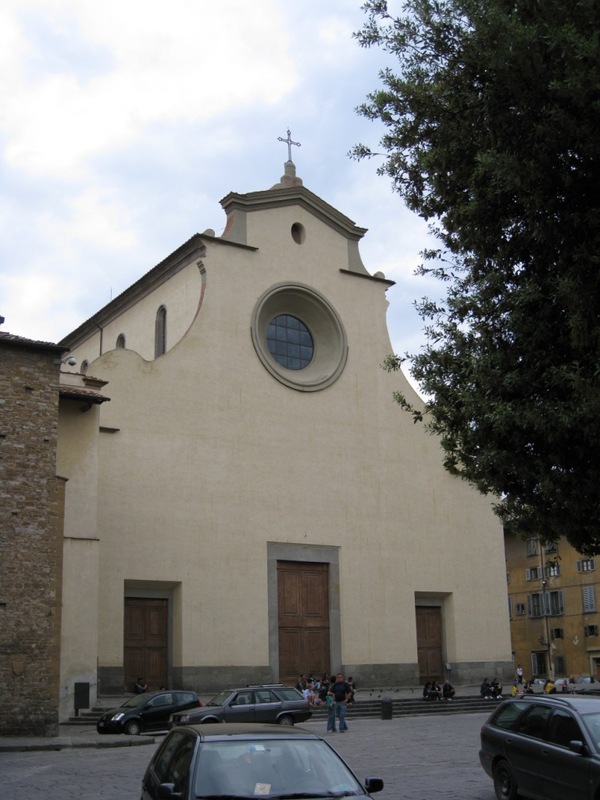 It had 38 chapels with paintings by Ghirlandaio and Filippino Lippi. It was a light airy church. Photographs were permitted. The exterior was finished in yellow stucco. We had a good visit there. 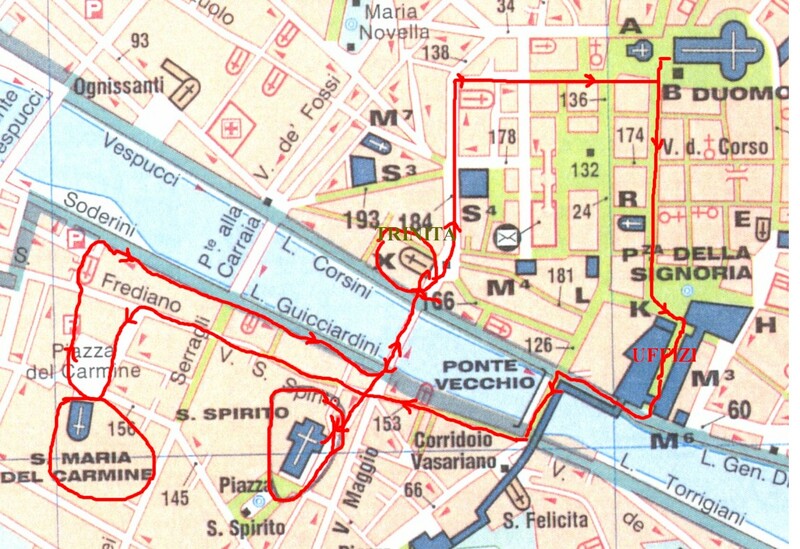 We walked back across the bridge and found the St. Trinita Church which was also on our list. The exterior had been finished but was rather plain. 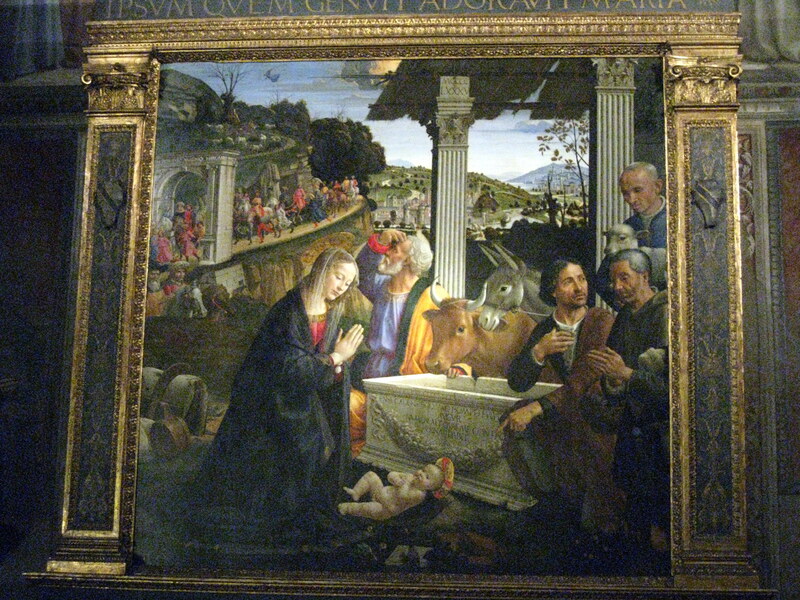 It was rather dark on the inside but had a famous chapel ….Sassetti chapel which had the life of St. Francis by Ghirlandaio. We had learned about it in the Teaching Company lectures. There was a coin operated lighting system that allowed a few minutes light in the chapel for a few coins. Photographs were permitted here also. We then headed back to the Duomo to find Mike and Mary. We stopped for a drink and caught the bus back to Fiesole. We decided to have dinner at Orlando…on top of the hill in Monteloro, but it wasn’t open. Since we were about half way to Sieci we voted to see what was open there for dinner, but everything there was closed. 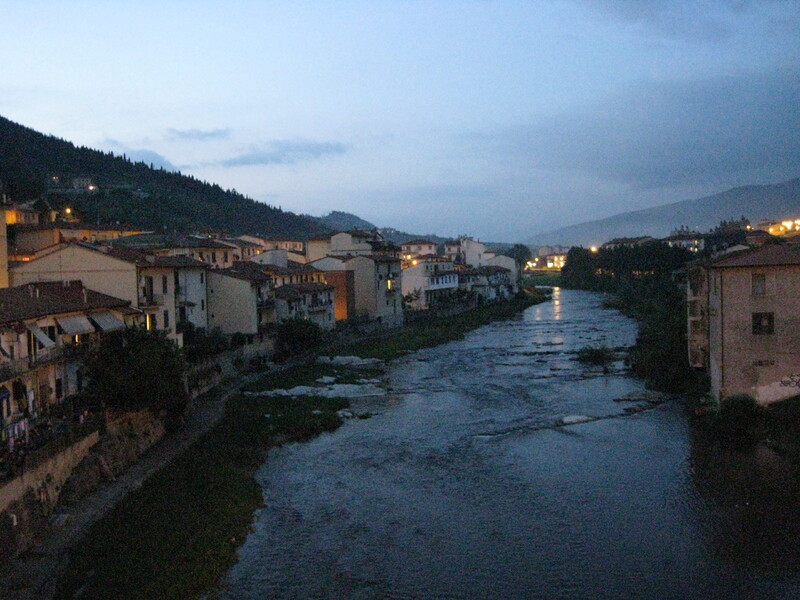 We kept driving to an attractive little town of Pontassieve and found a great restaurant. There was a sign on the door that said they spoke German. which didn’t help us too much. There was nothing in English and the waitress couldn’t speak any English. Mike tried hard to speak to her. My wife had spaghetti and I had a very thick steak with mushroom. It was delicious. It was a local restaurant and we seemed to be the only tourists, or at least the only ones speaking English. Some of the children who were dining had a good time staring at us. So we drove over the mountain again to our cozy villa apartment for a good night’s rest after a long and fun day. How wonderful to see all those masterpieces in person.